We all know that not everybody posseses chefs’ techniques when preparing food, especially when stir-frying and turn ingredients and this things make you get frustrated sometimes. Boomerang Wok designed by Nikolai Carels designed for Dutch brand Royal VKB makes you forget about normal woks which aren’t good enough, if you don’t know how to handle them to turn ingredients correctly and they tend to end up next to the pan. Apparently Boomerang wok is like any other wok you know: made of aluminium, Teflon, with a plastic handle. But a closer look reveals a unique, patented cupped edge at the front, which makes your cooking process easier than before by preventing food spilling out of the pan. It lets you toss the food with a flick of the wrist, only to return safely into the pan’s center. Moreover, this interesting wok help you turn easier even the larger pieces of food, such as a fillet of fish or meat. 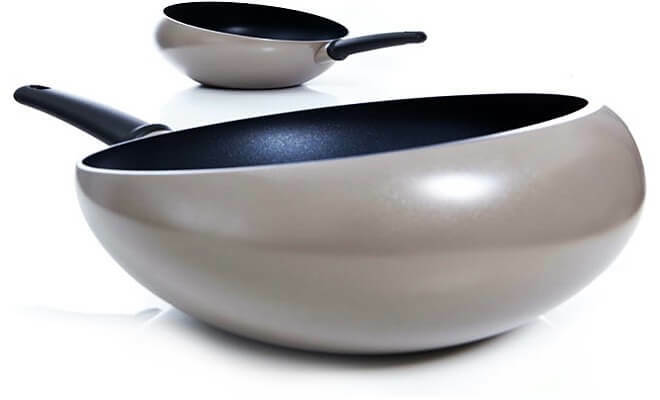 Available in three models (warm grey, dark grey and tri-ply), Boomerang wok is suitable for all heat sources. So, if you love stir-frying your food while reducing possible mess, we think this product is a perfect choice.